How energy efficient is an air conditioning unit? How does an air conditioning unit work? You don't need a detailed technical understanding of how your air conditioner works to enjoy its cooling breeze during the summer, but it's a good idea to at least know the basics. That way, you can be sure you're choosing the best system for your home, and you're more likely to notice if something goes wrong. There are different types of air conditioners to choose from, but they all work on the same basic principle – replacing the warm air inside your home with cool air, and transferring that heat outside. Your home's air conditioning works in the same way as your refrigerator, which removes heat energy from inside the chiller cabinet and vents this out through the back. Except in this case, your whole house is the chiller cabinet and the air is vented outside. The indoor unit of your air conditioner (the evaporator) draws in warm air through its grilles. This passes over pipes that contain a liquid refrigerant, which absorbs the heat energy and cools the air. In most systems, a dehumidifier will also remove moisture to dry the air. The main difference between air conditioners and fridges (besides the size) is that A/C systems use fans to circulate the air more efficiently. After the air has been cooled inside the evaporator, it's blown back into the room to help lower its temperature. As the liquid refrigerant in the air conditioner absorbs heat from the air, the liquid evaporates into a warm gas. It travels through ducts or pipes to the outdoor unit (the condenser), where most of its heat is transferred to the outside air. Cooled, it then condenses back into a liquid and flows back inside the building to repeat the cycle again. Reverse cycle air conditioners can provide heating in the winter as well as cooling in the summer. If the heating mode is selected, a heating element is activated instead of the refrigerant, which heats the air passing over it. This warmer air is then blown into rooms, with the cool air being vented outside. Are all air conditioners the same? Although they all use the same basic components, there are big differences between different types of air conditioners. The system that's best for you depends on the size of your home, the number of people living in it and your price range. 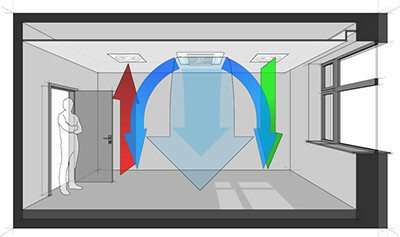 Ducted systems connect multiple indoor units to a single outdoor condenser via ducts in the walls, ceiling or floors. This is the most discreet air conditioning option and can be the most energy-efficient in a larger home, although it's usually more expensive to install. Split systems are easier to install as they don't require ducts. The indoor and outdoor units are connected via hoses, and you can still connect multiple indoor units to a single outdoor unit in a multi-head split system. Portable and window-mounted air conditioners are the simplest types of all, as everything is contained in a single unit. These are less energy-efficient and produce more noise, but they can be suitable for temporary use or for cooling small rooms. Are you thinking about installing air conditioning in your home or business? Get in touch with Maxim Air's cooling specialists in Sydney and we'll help you choose the right system for your needs. Call us on 0424 448 898 or contact us online to get your obligation-free quote.